Editing the book, 75 Years of Memories – about Women in the Royal New Zealand Navy wasn’t Anne Hine’s first foray into the world of publishing. With nine romance novels to her name, Anne definitely knows her away around a book. Dreams of writing weren’t on her mind when she joined the Wrens in 1970 as a young 17 year old from Colac Bay, near Riverton in Southland. Anne first dreamed of a career in the Police, having started a regular correspondence with the Police recruiters aged eight. To their credit, the Police recruiters diligently replied, keeping the young Anne dreaming of a career in blue. But it was a different uniform that would capture her interest for over 20 years. Leaving school at 17, Anne was faced with the dilemma of needing to fill in three years before she could apply to join the Police. Those helpful recruiters suggested she fill in the time nursing, teaching or joining one of the armed forces. “I’m not really sure why I chose the Navy, I just knew teaching and nursing wouldn’t be my thing and Army or Airforce weren’t appealing either. Looking back, maybe it was growing up by the sea, I’d always loved the sea, even if I hadn’t spent much time on or in it,” laughs Anne. Anne also credits her Mum, Merville Ashby who brought up three children on her own. Anne’s father passed away when she was just two years old. Having decided on the Navy, Anne drove from Te Anau where she’d been working in a travel lodge, to the Dunedin recruiting office. Asked at the interview which trade she wanted to pursue, she quickly named signals but was stumped when asked to name her second choice, eventually settling on ‘cook’. Luckily for Anne she got her first choice! It was a time of many ‘firsts’ for Anne. Along with another recruit, Gay Dickie from Christchurch, she had her first air-flight from Invercargill to Auckland. They were picked up from the airport and safely deposited at Margaret House – her home for the next few months. There were nine in Anne’s intake. Their initial three week training largely involved drill, drill, and more drill, lectures in naval history/terminology etc. and lots of PT. At the recent 75th reunion, Anne laughingly recalls a group of Wrens reminiscing about the very unattractive wide-leg shorts they wore for PT. Unfortunately attempts to track down a pair for the reunion had been unsuccessful! Returning from Christmas leave, Anne’s trade training began at the Communications Training School on North Head. Anne’s training differed quite a bit from her male counterparts. Women didn’t learn how to signal with flags or lights and weren’t taught Morse code. Training focused on typing, sending/receiving signals via teleprinter and delivering signals around the base on foot. Anne’s first posting was to the Naval Communications Centre in the dockyard where signals were typed, sent and received. She joined a watch with three signalmen who quickly took on the role of protector for the young Anne. They were very quick to put any sailor who showed a bit too much interest, in his place. However, one young sailor, Gary Hine then serving on HMNZS Taranaki wasn’t giving up that easily. Proving rather persistent, he won a date and a few years later Anne’s hand. Forty-three years and four children later, they’re still an item! After about 18 months in the service, Anne headed off to do her Leading Hand course and whilst there got wind of a posting to Singapore that was up for grabs. Throwing her hat in the ring, she figured it was a long-shot as she’d only just completed her course so was delighted when she secured one of two spots. Within three months she was off to Singapore on a two-year posting. The posting was another first for Anne as she and Nora Te Ua were the first Wrens to be posted overseas. Nora was later replaced by Mary Lou MacDonald. Realising her thirst for travel and adventure first ignited by her Mum, proved a highlight for Anne, who enjoyed many happy days exploring various parts of South East Asia. “It was an amazing posting. Definitely one of the highlights of my naval career,” says Anne. With her two years almost up, Anne and a girlfriend planned an extended holiday touring Europe. Unexpected delays with leave approvals meant the pair missed out on cheap flights so to economise they flew Aeroflot, which included a 24 hour stopover in Moscow, attracting the inevitable disapproval of intelligence officials. 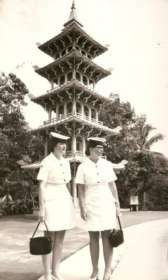 Once back in Singapore, the women were ‘debriefed’ and received a rather stern ‘ticking off’. “I don’t know how I had the nerve. Honestly, I knew we weren’t meant to fly through the USSR but I’d saved the money, booked the leave and come hell or high water I was going,” remembers Anne. 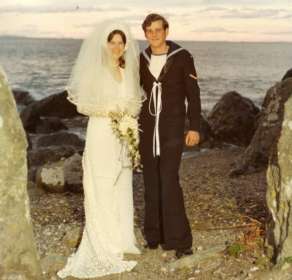 Back in New Zealand with a wedding to organise, Anne decided to make use of a rehabilitation loan from the Housing Corporation, available to service personnel who had completed a posting of 20 months or more; ideal to help fund a first mortgage. Anne and Gary on their wedding day, 1975. Having not experienced any gender issues during her time in the Navy, Anne was surprised to find her application denied as she was a ‘single woman’. Once married, she decided to apply again arguing that as she was earning more than Gary at the time, she was therefore the main breadwinner and should be eligible for the loan. Despite support from Navy Housing Corporation didn’t accept the argument. Undeterred, Anne contacted a lawyer who in turn approached the Ombudsman who challenged the term ‘serviceman’ used in the eligibility criteria, arguing it referred to both genders. An argument that proved successful and a feather in Anne’s cap for gender equality! A couple of year’s later the criteria was further expanded to include single women. 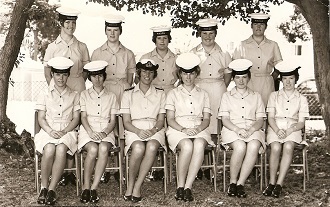 Time as a Basic Common Training Instructor at HMNZS Tamaki also rates highly for Anne who described her approach to the young recruits as ‘mothering’. She was determined to get all her charges through and was somewhat dismayed when she was called into the Divisional Officer’s Office after passing out to be told, “Our job is to get rid of the ones who aren’t right, not to pass them all!” Forty years on Anne still has a special place in her heart for her ladies, as she used to call her recruits. Postings to the Radio Communications Station, HMNZS Irirangi in Waiouru, and then back to Devonport followed. Finally hanging up her uniform after 21 years in 1991, Anne dedicated the next few years to fulltime motherhood, until a night class, ‘How to write a romance novel’ ignited a new passion. Encouraged by daughter Samara, “Mum your brain’s stagnating’ she embarked upon a 16 week journey of discovery. A contract with boutique publisher Wild Rose Press in New York followed. 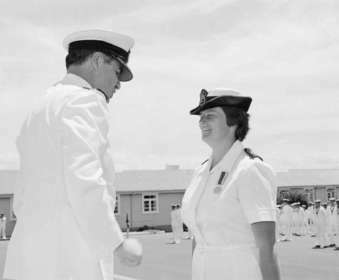 Fast forward to 2017, when Anne was called upon to use her writing skills and publishing knowledge to spearhead the compilation of a book documenting the memories of the women of the Royal New Zealand Navy, over the last 75 years. A true labour of love, Anne confesses, “It was divorce city regularly at my house during the five month production period”. Recently retired after 43 years in the Navy, Gary proved an able assistant transcribing numerous handwritten memories. With help from the Navy Museum team including Paul Restall and Navy Today editor, Andrew Bonallack, Anne managed to complete the book in time for the 75th reunion of women’s service in both the Women’s Royal New Zealand Naval Service and the Royal New Zealand Navy, in October last year. Anne reckons there must be another book out there of Wren/navy women’s memories. She challenges people to come forward with those forgotten stories. If she can get 100 more stories, Anne will happily put together a second volume, fitted in around her romance writing. 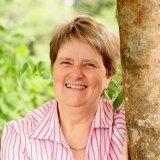 Writing under her maiden name, Ashby, Anne has garnered quite a following local and international. Reflecting on her time in the Navy, she doesn’t have regret for a moment, choosing Navy white over Police blue. “I’m proud of having served in every (on shore) ship available at the time. Navy gave me some wonderful experiences which I will carry with me always,” says Anne. 75 Years Of Memories – Women in the Royal New Zealand Navy is available to purchase from the Museum store $40 each.